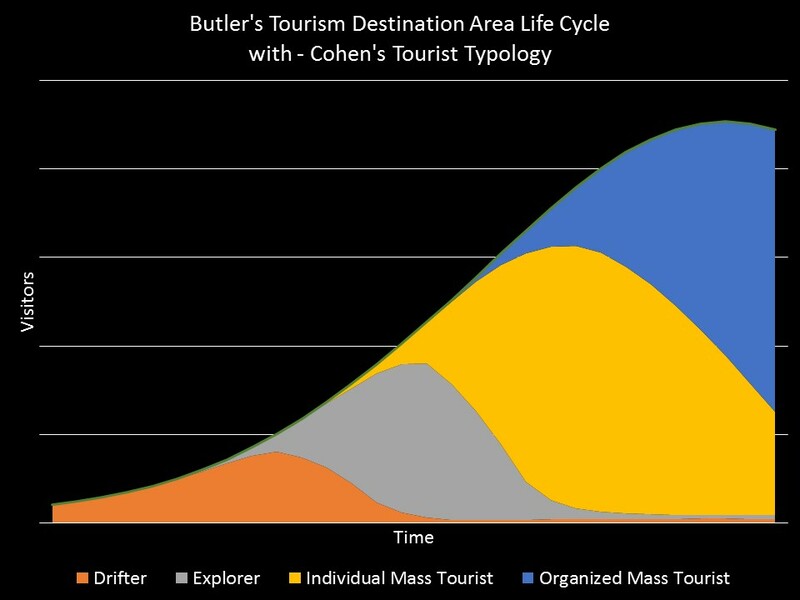 This is a theoretical graph of visitor numbers over time as a destination develops. The concept is helpful for communities to understand that tourist destinations don’t start out as thriving economic generators but progress from unique hideaway to chic destination and eventually into decline. In the early stages of development the destination is visited by people who characterize themselves as travelers as opposed to tourists…known as the drifter. The Drifter Typology is usually associated with backpackers often trying to find undiscovered places. As the destination becomes discovered the Explorer Typology will begin to visit. These travelers are usually willing to spend more to visit a new and ‘unspoiled’ destination…think hippies becoming yuppies. As the destination matures it becomes mainstream and Mass Tourists start to plan their own trips, seeking a more developed destination. Finally, large tour operators see an opportunity to package and sell the destination. As mass tourist visits increase, the early adopters seek out other undiscovered places. At the peak of the curve visits may start to decline because the destination is over capacity, may stabilize at a sustainable level, or the destination may rejuvenate itself and continue to grow again. Over a longer time period, a destination may go through many cycles of rise and decline. Awareness of these cycles can assist destination planners to anticipate and strive to mitigate the declines.